Abstract: Mutations of the CFTR gene cause cystic fibrosis (CF), the most common recessive monogenic disease worldwide. These mutations alter the synthesis, processing, function, or half-life of CFTR, the main chloride channel expressed in the apical membrane of epithelial cells in the airway, intestine, pancreas, and reproductive tract. Lung disease is the most critical manifestation of CF. It is characterized by airway obstruction, infection, and inflammation that lead to fatal tissue destruction. In spite of great advances in early and multidisciplinary medical care, and in our understanding of the pathophysiology, CF is still considerably reducing the life expectancy of patients. This review highlights the current development in pharmacological modulators of CFTR, which aim at rescuing the expression and/or function of mutated CFTR. While only Kalydeco® and Orkambi® are currently available to patients, many other families of CFTR modulators are undergoing preclinical and clinical investigations. 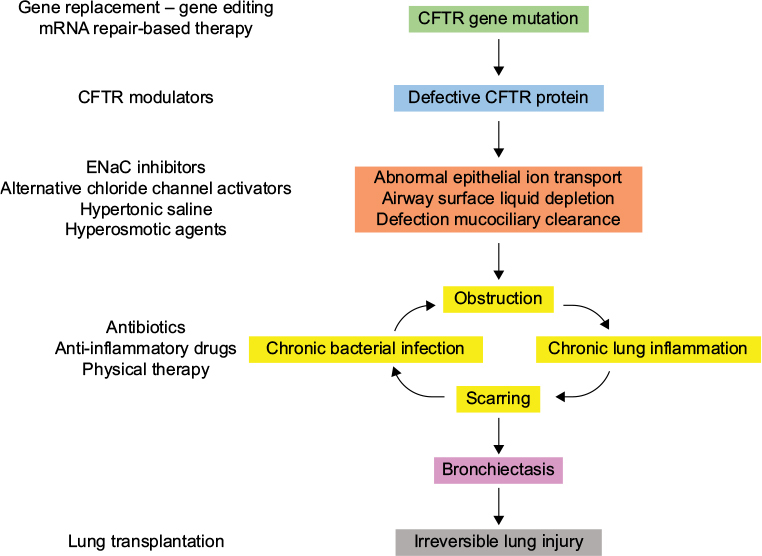 Drug repositioning and personalized medicine are particularly detailed in this review as they represent the most promising strategies for restoring CFTR function in CF. Cystic fibrosis (CF) is an inherited (recessive autosomal) chronic disease that affects the respiratory, digestive, and reproductive systems. Although intestinal symptoms are usually the first to occur during the life of the patient, it is the progressive lung damage, due to cycles of infection/inflammation, that finally leads to irreversible lung disease and death. With ~90,000 people diagnosed, a prevalence of 1/2,500 and about one carrier among 25 individuals, CF is the most common life-threatening Mendelian disorder worldwide. Advances in research and medical treatments have raised the life expectancy of CF newborns beyond 50 years; however, the current median age of survival for CF patients is still in the late 20s. CF is caused by mutations in the CF transmembrane conductance regulator (CFTR) gene, which was cloned and identified as the gene affected in CF in 1989.1 CFTR gene encodes the main anion channel expressed in the epithelium. Additionally, CFTR is also expressed in many other cells types (eg, fibroblasts,2 neurons,3 cardiomyocytes,4 and immune cells5–7), where its function is not always well known. Among the 2,000+ CFTR mutations identified so far (http://genet.sickkids.on.ca), only a fraction of them causes CF. These CF-causing mutations induce a decrease or a loss of function of CFTR at the plasma membrane. In the lung, the lack of CFTR leads to dehydration of the airway surface liquid and drives the cascade of pathological events characteristic of CF (Figure 1). Figure 1 Pathophysiology of CF lung disease and potential therapies targeting the basic defect or the symptoms. Note: In the absence of conclusive data on gene therapy, CFTR modulators are the most proximal therapy for CF currently in development. Abbreviations: CF, cystic fibrosis; CFTR, cystic fibrosis transmembrane conductance regulator; ENaC, epithelial sodium channel; mRNA, messenger RNA. The CFTR gene contains 27 exons spanning 250 kb on the long arm of chromosome 7 (7q31.2).8,9 The encoded mRNA is ~6.5 kb long and is translated into a protein of 1,480 amino acids. The CFTR protein belongs to the adenosine triphosphate (ATP)-binding cassette (ABC) transporters and functions as an adenosine 3′,5′-cyclic monophosphate (cAMP)-regulated chloride channel in a variety of polarized epithelial cells.10 The predicted protein structure is shown in Figure 2. Figure 2 Predicted topology of CFTR protein. Notes: It is composed of two repeated units made of a MSD followed by a NBD. The two repeated units are linked by a R domain. The MSDs consist of six hydrophobic transmembrane helices (or TMD). Several transmembrane helices contain one or more charged amino acids that control anion permeability. Extracellular loop 4 (between TMD7 and TMD8) contains two N-glycosylation sites. 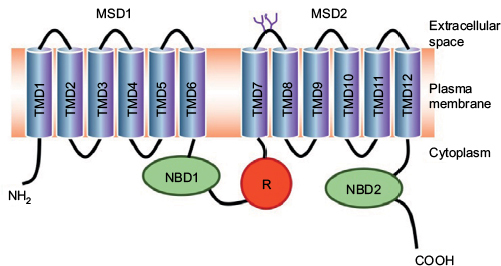 Abbreviations: CFTR, cystic fibrosis transmembrane conductance regulator; MSD, membrane-spanning domain; NBD, nucleotide-binding domain; TMD: transmembrane domain; R, regulatory domain. CFTR is the only ABC transporter functioning as an ion channel. The characteristic properties of CFTR-associated conductance are a linear current–voltage relationship and a single conductance of 6–11pS.30,31 Although CFTR may also transport negatively charged organic molecules such as gluconate32 and glutathione,33,34 it is mostly selective for monovalent anion. In vivo, it mainly transports Cl- and HCO3-.31,35 Lack of apical Cl- secretion in CF epithelial cells had already been characterized several years before the discovery of the CFTR gene.36 Over the past few years, it has become apparent that CFTR-dependent bicarbonate secretion, required for normal expansion of mucins (the main component of mucus), is also defective in patients with CF.37 Therefore, the role of CFTR in CF pathogenesis is both due to lack of Cl-, resulting in low hydration of the airway surface liquid, and decrease of HCO3– transport, which maintain mucins in an aggregated and poorly soluble form. Abbreviation: CFTR, cystic fibrosis transmembrane conductance regulator. Class IV mutant proteins are correctly inserted at the plasma membrane but the channel single conductance is altered. The most frequent class IV mutations encountered in patients are R117H (1.3%) and R347P (0.37%). Class V (eg, A455E and 2789+5G→T) and VI (eg, 4326delTC and 4279insA) mutations lead to reduced amount of CFTR protein at the plasma membrane, by affecting CFTR mRNA (stability, alternative splicing, etc) or increasing the turnover of the CFTR protein, respectively. Some CFTR mutations display more than one type of dysfunctions. For example, in addition to trafficking defect, F508del-CFTR also presents with characteristic defects of classes III and IV, with a reduced open probability63 and decreased membrane stability,64 respectively. The expression and activity of CFTR channels are regulated by many intracellular signaling pathways. The most known modulator of the CFTR chloride channel is intracellular cAMP, and the activity of CFTR is mainly regulated via phosphorylation by various protein kinases and dephosphorylation by protein phosphatases. Very low cytotoxicity and high abundance of natural compounds in regular aliment make them an appealing therapeutic option. It seems difficult to achieve sufficiently high concentration of these compounds from food intake only; therefore, administering purified compounds at higher doses could be considered. They may not be selective enough, however, as they often regulate various cellular and biochemical functions. The goal of drug repositioning is to identify new indications of marketed drugs in particular for rare and neglected diseases.90 They have multiple advantages over innovative treatments: they are considered safer, as they have already undergone extensive toxicology and safety assessment, they are often less expensive, and shortage is less likely to occur. PDE5 inhibitors (iPDE5) and soluble guanylyl cyclase activators are currently approved for the treatment of erectile dysfunction96 and pulmonary hypertension.97 They both lead to increased intracellular cGMP content, although the final mechanism of action on CFTR is still unknown. Some data suggested two distinct effects: a cGMP-dependent increase in CFTR activity and a cGMP-independent effect on CFTR trafficking.98 Some in vitro studies required 1,000-fold greater concentration than what is used in the clinic to observe an effect on CFTR trafficking.98,99 In vivo preclinical studies have yet showed that improvement in chloride transport could be achieved with clinical doses of iPDE5, such as sildenafil and vardenafil, in CF mice.100,101 Outcomes of a Phase IIa open-label study aiming at investigating safety and efficacy of sildenafil in CF lung disease were recently published.102 No change in sputum IL-8 was noted, but sputum neutrophil elastase content was significantly reduced after treatment. However, pharmacokinetic profiles of sildenafil suggested that CF patients may eliminate sildenafil at a faster rate than non-CF patients. Similar to iPDE5, riociguat (BAY 63-2521) increases intracellular cGMP levels in a concentration-dependent manner and in synergy with nitric oxide (NO).103,104 It is a soluble guanylate cyclase activator developed by Bayer, already approved for pulmonary arterial hypertension. A Phase II trial is currently ongoing for adult CF patients homozygous for F508del mutation (NCT02170025). Escin, extracted from horse chestnut tree, possesses anti-inflammatory effects and is already used in patients with chronic venous insufficiency, hemorrhoids, and post-traumatic edema.113 Escin significantly enhanced CFTR function in Fisher rat thyroid cells transfected with different CFTR class I mutants (G542X, W1282X) and in primary HBECs isolated from G542X/F508del and W1282/F508del patients.114 By contrast, escin failed to improve CFTR function in HBECs from a patient homozygous for F508del, demonstrating that Escin acts as a readthrough agent for nonsense mutations. All these compounds are excellent illustrations that, as for many other rare diseases, CF therapy may benefit from drug repositioning as a strategy to speed up drug development. With the development of high-throughput screening (HTS) assays allowing rapid screening of thousands of small molecules, many families of chemical structures have been identified. Thanks to expanding knowledge of the structure and function of CFTR, and to increased understanding of the different functional consequences of CFTR mutations, structure–activity relationship and optimization of the most promising lead compounds have led to a series of potential pharmacological therapies for CF to correct CFTR defects at different levels.114–117 CFTR modulators can be categorized according to the class of mutation or dysfunction that they aim at targeting (Figure 3 and Table 2). 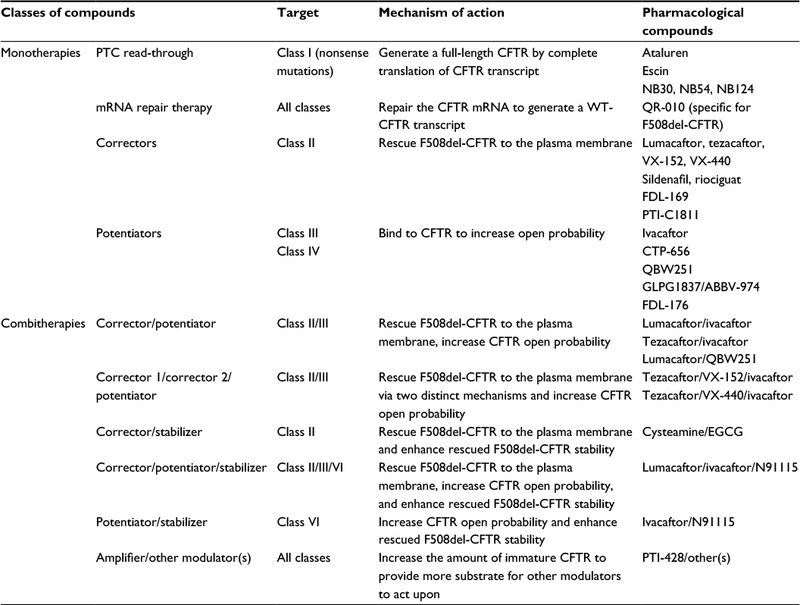 Figure 3 Overview of the most advance CFTR modulators in preclinical and clinical studies, with regard to the class of CFTR mutations and the primary defect of the corresponding mutant protein. Abbreviations: CFTR, cystic fibrosis transmembrane conductance regulator; PTC, premature termination codon; EGCG, epigallocatechin gallate; ER, endoplasmic reticulum; Ub, ubiquitin; mRNA, messenger RNA. Abbreviations: CFTR, cystic fibrosis transmembrane conductance regulator; CF, cystic fibrosis; PTC, premature termination codon; mRNA, messenger RNA; WT, wild type. Through HTS, PTC Therapeutics™ (Dublin, Ireland) identified PTC-124 (3-[5-(2-fluorophenyl)-1,2,4-oxadiazol-3-yl]-benzoic acid), ataluren. It is an orally bioavailable small molecule inducing complete translation of proteins containing premature nonsense mutations without affecting the normal stop codons.130 In the initial Phase II trial, CF adults with at least one CFTR nonsense mutation received oral treatment with ataluren for 14 days followed by a washout period of 14 days.131 CFTR function measured by NPD was restored and a small decrease in ENaC activity was also recorded. Moreover, patients presented with slight increase in FEV1 and bodyweight, and some of them reported an improvement in pulmonary symptoms such as cough. A pediatric trial was conducted with children of age 6 and older, and demonstrated similar improvements in CFTR function although it did not correlate with FEV1.132 Despite these encouraging data, ataluren did not provide a significant improvement in FEV1 of a Phase III placebo-controlled trial.133 Interaction with chronically inhaled tobramycin could be a cause, as the subgroup of patients not receiving inhaled aminoglycosides showed a more robust improvement in FEV1 (+5.7% predicted) together with fewer pulmonary exacerbations (-40%) in the ataluren group as compared to the placebo. Moreover, variable responses were found among patients with different genotypes suggesting that readthrough agents may not work for all class I mutations. With the development of HTS assays and medicinal chemistry, many families of new chemical structures with corrector properties have emerged. Their corrector activities are exerted through direct modulation of protein folding140,141 or cellular proteostasis,142 or may act as pharmacological chaperons.143 While many of the compounds available so far, such as corr-4a116 or VRT-325,141 will never progress beyond the status of “bench tools”, some hits have been identified and optimized in view of clinical assessments. The most advanced corrector for F508del-CFTR is VX-809 (lumacaftor), developed by Vertex Pharmaceuticals (Boston, MA, USA). VX-809 restores F508del-CFTR trafficking by improving its folding and stabilizing membrane-spanning domain 1.144,145 Four weeks of oral lumacaftor as monotherapy in homozygous F508del-CFTR patients was demonstrated safe and well tolerated.146 Sweat chloride contents were significantly decreased with treatment in a dose-dependent manner. However, lumacaftor failed to demonstrate any therapeutic benefit for lung function as it did not change FEV1 nor modulate NPD parameters. This lack of clinical effect suggested that corrector-based monotherapies are not efficient enough to improve lung function because they do not target the other biological defects of F508del-CFTR, ie, decreased membrane stability and open probability. Because in vitro studies showed that CFTR potentiator VX-770 (see ivacaftor, classes III and IV) improved the open probability of VX-809-rescued F508del-CFTR,145 a new Phase II147 and a Phase III148 studies with combination of lumacaftor and ivacaftor were conducted. Overall, the absolute increase in FEV1 was modest (+3%).148 Currently marketed as Orkambi®, the ivacaftor–lumacaftor combination has been heavily challenged because it seems no more efficient that conventional multitherapies149 for a price outrageously tenfold higher.150 More importantly, two in vitro studies evidenced negative interference between ivacaftor and several correctors including lumacaftor, as prolonged exposure of HBECs with ivacaftor decreases the stability of lumacaftor-corrected F508del-CFTR.151,152 This could explain in part the modest improvement of lung function observed in patients taking lumacaftor/ivacaftor. More next-generation correctors such as VX-152 and VX-440 will be evaluated in combination with VX-661/ivacaftor as triple combinations (VX-152/VX-661/ivacaftor and VX-440/VX-661/ivacaftor) in homozygous F508del patients and patients with one F508del associated with a second mutation that results in minimal CFTR function. In vitro, these triple combinations resulted in an increase in chloride transport in HBECs approximately threefold higher than with lumacaftor/ivacaftor. Other drug discovery companies have undertaken development of correctors. Among them, PTI-C1811 (Proteostasis Therapeutics, Cambridge, MA, USA) and FDL-169 (Flatley Discovery Lab, Charlestown, MA, USA) act through different mechanisms than VX-809 and are both claimed to have similar or superior in vitro activity when combined with potentiators. Unlike CFTR correctors that act at the protein level, ProQR Therapeutics NV (Leiden, the Netherlands) developed QR-010, a single-strand modified RNA specifically designed to repair the F508del mutation at the mRNA level to generate a WT-CFTR transcript. In vivo in a preclinical mouse model, QR-010 demonstrated a robust increase in CFTR activity measured by NPD154 and a restoration of CFTR-dependent salivary secretion rates.155 QR-010 is now being tested in two clinical trials. In a Phase Ib study (NCT02532764), single and multiple ascending doses will assess QR-010 safety and tolerability in F508del homozygous patients. The second study (NCT02564354) is exploratory proof-of-concept study in CF patients with at least one copy of F508del. It will explore whether intranasal administration of QR-010 can restore function of the CFTR protein as measured by NPD. Class III and IV mutations are considered mild because they produce full-length CFTR that inserts into the plasma membrane where it can correctly interact with other proteins. However, chloride transport is reduced because the open probability (class III) or the single conductance (class IV) of the channel is altered. Pharmacological compounds that enhance CFTR function at the cell membrane are called potentiators. During the initial screening, ivacaftor was shown to also potentiate activity of rescued F508del-CFTR.156 As expected with a potentiator, a clinical trial with ivacaftor for F508del/F508del patients failed to support its use as a monotherapy for this class of patients.162 As of now, ivacaftor (Kalydeco®; Vertex Pharmaceuticals) is the only potentiator approved for CF patients aged 2 years and older who carry at least one of the following mutations: G551D, G1244E, G1349D, G178R, G551S, S1251N, S1255P, S549N, S549R or R117H. Ivacaftor is seen by the CF community as a proof of principle of clinical benefit from a CFTR modulator, and its approval was a very significant milestone in CF treatment. QBW251 is a potentiator developed by Novartis Pharmaceuticals. In vitro data showed superior efficacy of QBW251 as compared to ivacaftor when both are combined with lumacaftor. Phase II trial (NCT02190604) has been conducted and some outcomes have been recently presented.164 CF heterozygous patients with at least one class III to VI mutation were enrolled (including patients with one F508del mutation as it can be considered either as class II, III, or VI). A separate arm of the study enrolled only F508del-CFTR homozygous patients. Orally administered QBW251 (150 mg or 450 mg, twice a day) for 2 weeks was safe and well tolerated in the 40 CF patients.164 In patients with a residual function, QBW251 (450 mg) statistically increased FEV1 over placebo by 7.3%, an increase that is considered as clinically relevant for lung function and very similar to that observed with ivacaftor. As for ivacaftor, QBW251 monotherapy did not demonstrate any efficacy in patients with two copies of F508del. The potentiator GLPG1837/ABBV-974 is codeveloped by Galapagos NV (Mechelen, Belgium) and AbbVie Pharmaceuticals (North Chicago, IL, USA). Phase I has demonstrated that single (up to 2 g) and multiple doses (up to 800 mg twice a day for 14 days) of GLPG1837/ABBV-974 were safe and well tolerated in healthy volunteers.165 Two Phase II open-label studies are ongoing and will explore GLPG1837/ABBV-974 safety, tolerability, and efficacy in CF patients with G551D (SAPHIRA1) and S1251N (SAPHIRA2). Currently, there is no clinical data available for class V-specific therapies. 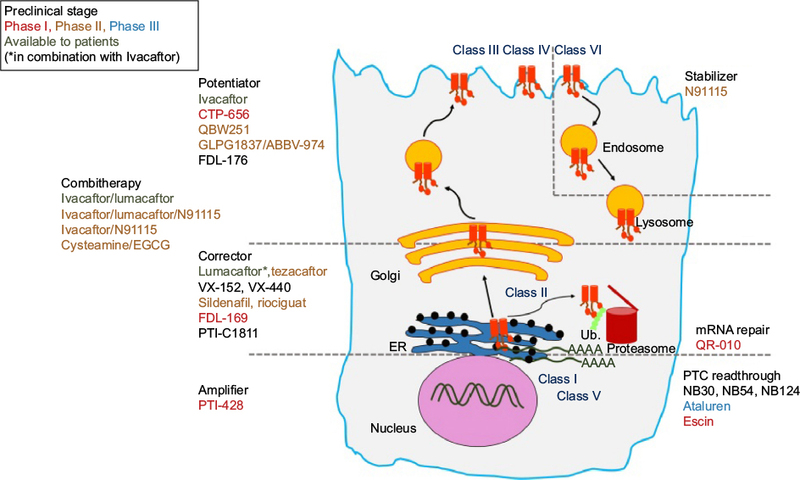 For class VI, a new class of compounds increasing the half-life of CFTR protein at the plasma membrane has recently attracted interest. VRT-325 and Corr-4a were prototypes for this type of compounds, so-called “stabilizers”, which are meant to be complementary to existing and future CFTR modulators. N91115, developed by Nivalis Therapeutics (Boulder, CO, USA), is an inhibitor of S-nitroglutathione (GSNO) reductase and aimed at increasing intracellular levels of GSNO. GSNO induces the S-nitrosylation of the cellular chaperone Hsp70/Hsp90 organizing protein which prevents the association of CFTR with Hsp70/Hsp90 organizing protein.166–168 N91115 was proven safe and well tolerated in CF patients with two F508del alleles.169 N91115 has recently received the status of Orphan Drug designation by the FDA and two Phase II clinical studies are ongoing (see “Combitherapies and personalized medicine” section). In the near future, potentiators may also prove useful to provide maximal activation of class VI mutants. Many pharmacological agents are currently in development to correct mutant CFTR activity in CF. These agents are becoming increasingly specific, and aim at targeting patients with particular genotype. The most advance treatment for CF currently available for patients is ivacaftor. This is a typical example of personalized medicine where only individuals with specific mutations can be treated with this drug. Although ivacaftor provides a significant improvement in lung function, this may not be achievable in every CF patient with a single compound. More specifically, in patients carrying CFTR mutations displaying multiple dysfunctions, such as F508del-CFTR, combination of several molecules will likely lead to better clinical results. Here, the biological defects of F508del-CFTR could be ideally addressed by a triple combination of a corrector to increase the amount of F508del-CFTR protein expressed in the plasma membrane, a potentiator to enhance its open probability and a stabilizer to increase its half-life at the plasma membrane. Another new class of compounds is currently investigated by Proteostasis Therapeutics. They are developing PTI-428, a CFTR amplifier, which aims to selectively increase the amount of immature form of CFTR protein to provide other CFTR modulators with more substrate to act upon.170 PTI-428 received Fast Track designation from the FDA and a Phase I is ongoing to assess its safety, tolerability and pharmacokinetics in CF patients (NCT02718495). One of the biggest challenges to implement personalized medicine for CF will be to develop new in vitro models to better predict the individual response of patient to different combinations of treatments. Development and use of experimental materials based on patient tissues (such as airway and intestinal organoids or induced pluripotent stem cells) will hopefully provide new powerful assays to better anticipate the individual clinical benefit of CFTR modulators. Many classes of compounds restoring the function of CFTR mutants have been identified; however, most of them, such as natural compound curcumin, were never translated into therapy mainly because of lack of benefit to patients as well as off-target effects or low bioavailability. Drug repositioning, through the exciting examples of the cystamine/EGCG combination or sildenafil, may speed up the development of novel therapies for CF. Currently, ivacaftor alone or in combination with lumacaftor are the only pharmacological modulators of CFTR approved for the treatment of CF. The combination lumacaftor/ivacaftor has been highly challenged as they do not seem to provide significant improvement in lung function as compared to conventional therapies. Ivacaftor targets only a specific CFTR mutant (G551D-CFTR) which is found in <2% of the patients, Finally, these two marketed therapies cost over USD 250,000/year (a tenfold increase as compared to usual multitherapies) for a modest improvement in the quality of life of patients. Thus, there is still a major and urgent need for new molecules and therapeutic approaches to be developed for treating CF. TL and SN received financial support from the European Commission under the H2020-PHC-13-2014 funding program (PRO-CF-MED, ref. 633545) granted to ProQR Therapeutics NV. Riordan J, Rommens J, Kerem B, et al. Identification of the cystic fibrosis gene: cloning and characterization of complementary DNA. Science. 1989;245(4922):1066–1073. Huaux F, Noel S, Dhooghe B, et al. Dysregulated proinflammatory and fibrogenic phenotype of fibroblasts in cystic fibrosis. PLoS One. 2013;8(5):e64341. Marcorelles P, Friocourt G, Uguen A, Ledé F, Férec C, Laquerrière A. Cystic fibrosis transmembrane conductance regulator protein (CFTR) expression in the developing human brain: comparative immunohistochemical study between patients with normal and mutated CFTR. J Histochem Cytochem. 2014;62(11):791–801. Gao Z, Sun HY, Lau CP, Chin-Wan Fung P, Li GR. Evidence for cystic fibrosis transmembrane conductance regulator chloride current in swine ventricular myocytes. J Mol Cell Cardiol. 2007;42(1):98–105. Bonfield TL, Hodges CA, Cotton CU, Drumm ML. Absence of the cystic fibrosis transmembrane regulator (Cftr) from myeloid-derived cells slows resolution of inflammation and infection. J Leukoc Biol. 2012;92(5):1111–1122. Di A, Brown ME, Deriy LV, et al. CFTR regulates phagosome acidification in macrophages and alters bactericidal activity. Nat Cell Biol. 2006;8(9):933–944. Painter RG, Valentine VG, Lanson NA, et al. CFTR expression in human neutrophils and the phagolysosomal chlorination defect in cystic fibrosis. Biochemistry. 2006;45(34):10260–10269. Zengerling S, Tsui LC, Grzeschik KH, Olek K, Riordan JR, Buchwald M. Mapping of DNA markers linked to the cystic fibrosis locus on the long arm of chromosome 7. Am J Hum Genet. 1987;40(3):228–236. Cheng SH, Rich DP, Marshall J, Gregory RJ, Welsh MJ, Smith AE. Phosphorylation of the R domain by cAMP-dependent protein kinase regulates the CFTR chloride channel. Cell. 1991;66(5):1027–1036. Csanády L, Seto-Young D, Chan KW, et al. Preferential phosphorylation of R-domain Serine 768 dampens activation of CFTR channels by PKA. J Gen Physiol. 2005;125(2):171–186. Billet A, Jia Y, Jensen T, Riordan JR, Hanrahan JW. Regulation of the cystic fibrosis transmembrane conductance regulator anion channel by tyrosine phosphorylation. FASEB J. 2015;29(9):3945–3953. Hallows KR, Kobinger GP, Wilson JM, Witters LA, Foskett JK. Physiological modulation of CFTR activity by AMP-activated protein kinase in polarized T84 cells. Am J Physiol Cell Physiol. 2003;284(5):C1297–C1308. Seavilleklein G, Amer N, Evagelidis A, et al. PKC phosphorylation modulates PKA-dependent binding of the R domain to other domains of CFTR. Am J Physiol Cell Physiol. 2008;295(5):C1366–C1375. Csanády L, Chan KW, Seto-Young D, Kopsco DC, Nairn AC, Gadsby DC. Severed channels probe regulation of gating of cystic fibrosis transmembrane conductance regulator by its cytoplasmic domains. J Gen Physiol. 2000;116(3):477–500. Chappe V, Irvine T, Liao J, Evagelidis A, Hanrahan JW. Phosphorylation of CFTR by PKA promotes binding of the regulatory domain. EMBO J. 2005;24(15):2730–2740. Hegedűs T, Aleksandrov A, Mengos A, Cui L, Jensen TJ, Riordan JR. Role of individual R domain phosphorylation sites in CFTR regulation by protein kinase A. Biochim Biophys Acta. 2009;1788(6):1341–1349. Wilkinson DJ, Strong TV, Mansoura MK, et al. CFTR activation: additive effects of stimulatory and inhibitory phosphorylation sites in the R domain. Am J Physiol Lung Cell Mol Physiol. 1997;273(1):L127–L133. Vais H, Zhang R, Reenstra WW. Dibasic phosphorylation sites in the R domain of CFTR have stimulatory and inhibitory effects on channel activation. Am J Physiol Cell Physiol. 2004;287(3):C737–C745. Bozoky Z, Krzeminski M, Muhandiram R, et al. Regulatory R region of the CFTR chloride channel is a dynamic integrator of phospho-dependent intra- and intermolecular interactions. Proc Natl Acad Sci U S A. 2013;110(47):E4427–E4436. Farinha CM, Swiatecka-Urban A, Brautigan DL, Jordan P. Regulatory crosstalk by protein kinases on CFTR trafficking and activity. Front Chem. 2016;4:1. Moran O. On the structural organization of the intracellular domains of CFTR. Int J Biochem Cell Biol. 2014;52:7–14. Hwang TC, Sheppard DN. Gating of the CFTR Cl(−) channel by ATP-driven nucleotide-binding domain dimerisation. J Physiol. 2009;587(pt 10):2151–2161. Lewis HA, Buchanan SG, Burley SK, et al. Structure of nucleotide-binding domain 1 of the cystic fibrosis transmembrane conductance regulator. EMBO J. 2004;23(2):282–293. Vergani P, Lockless SW, Nairn AC, Gadsby DC. CFTR channel opening by ATP-driven tight dimerization of its nucleotide-binding domains. Nature. 2005;433(7028):876–880. Zhou Z, Wang X, Liu HY, Zou X, Li M, Hwang TC. The two ATP binding sites of cystic fibrosis transmembrane conductance regulator (CFTR) play distinct roles in gating kinetics and energetics. J Gen Physiol. Anderson M, Gregory R, Thompson S, et al. Demonstration that CFTR is a chloride channel by alteration of its anion selectivity. Science. 1991;253(5016):202–205. Linsdell P. Mechanism of chloride permeation in the cystic fibrosis transmembrane conductance regulator chloride channel. Exp Physiol. 2006;91(1):123–129. Linsdell P, Hanrahan JW. Adenosine triphosphate–dependent asymmetry of anion permeation in the cystic fibrosis transmembrane conductance regulator chloride channel. J Gen Physiol. 1998;111(4):601–614. Gould NS, Min E, Martin RJ, Day BJ. CFTR is the primary known apical glutathione transporter involved in cigarette smoke induced adaptive responses in the lung. Free Radic Biol Med. 2012;52(7):1201–1206. Linsdell P, Hanrahan JW. Glutathione permeability of CFTR. Am J Physiol Cell Physiol. 1998;275(1):C323–C326. Tang L, Fatehi M, Linsdell P. Mechanism of direct bicarbonate transport by the CFTR anion channel. J Cyst Fibros. 2009;8(2):115–121. Quinton PM. Chloride impermeability in cystic fibrosis. Nature. 1983;301(5899):421–422. Knowles M, Gatzy J, Boucher R. Increased bioelectric potential difference across respiratory epithelia in cystic fibrosis. N Engl J Med. 1981;305(25):1489–1495. Bangel-Ruland N, Tomczak K, Weber WM. Targeting ENaC as a molecular suspect in cystic fibrosis. Curr Drug Targets. 2015;16(9):951–957. Matsui H, Grubb BR, Tarran R, et al. Evidence for periciliary liquid layer depletion, not abnormal ion composition, in the pathogenesis of cystic fibrosis airways disease. Cell. 1998;95(7):1005–1015. Collawn JF, Lazrak A, Bebok Z, Matalon S. The CFTR and ENaC debate: how important is ENaC in CF lung disease? Am J Physiol Lung Cell Mol Physiol. 2012;302(11):L1141–L1146. Hobbs CA, Da Tan C, Tarran R. Does epithelial sodium channel hyperactivity contribute to cystic fibrosis lung disease? J Physiol. 2013;591(pt 18):4377–4387. Berdiev BK, Cormet-Boyaka E, Tousson A, et al. Molecular proximity of cystic fibrosis transmembrane conductance regulator and epithelial sodium channel assessed by fluorescence resonance energy transfer. J Biol Chem. 2007;282(50):36481–36488. Ji HL, Chalfant ML, Jovov B, et al. The cytosolic termini of the β- and γ- ENaC subunits are involved in the functional interactions between CFTR and ENaC. J Biol Chem. 2000;275(36):27947–27956. Kunzelmann K, Kiser GL, Schreiber R, Riordan JR. Inhibition of epithelial Na+ currents by intracellular domains of the cystic fibrosis transmembrane conductance regulator. FEBS Lett. 1997;400(3):341–344. Konstas AA, Koch JP, Korbmacher C. cAMP-dependent activation of CFTR inhibits the epithelial sodium channel (ENaC) without affecting its surface expression. Pflügers Arch. 2003;445(4):513–521. Chinet TC, Fullton JM, Yankaskas JR, Boucher RC, Stutts MJ. Mechanism of sodium hyperabsorption in cultured cystic fibrosis nasal epithelium: a patch-clamp study. Am J Physiol Cell Physiol. 1994;266(4):C1061–C1068. Gentzsch M, Dang H, Dang Y, et al. The cystic fibrosis transmembrane conductance regulator impedes proteolytic stimulation of the epithelial Na(+) channel. J Biol Chem. 2010;285(42):32227–32232. Lu C, Jiang C, Pribanic S, Rotin D. CFTR stabilizes ENaC at the plasma membrane. J Cyst Fibros. 2007;6(6):419–422. Horisberger J-D. ENaC–CFTR interactions: the role of electrical coupling of ion fluxes explored in an epithelial cell model. Pflügers Arch. 2003;445(4):522–528. Kunzelmann K. ENaC is inhibited by an increase in the intracellular Cl- concentration mediated through activation of Cl- channels. Pflügers Arch. 2003;445(4):504–512. Kunzelmann K, Tian Y, Martins JR, et al. Airway epithelial cells – functional links between CFTR and anoctamin dependent Cl− secretion. Int J Biochem Cell Biol. 2012;44(11):1897–1900. El Khouri E, Touré A. Functional interaction of the cystic fibrosis transmembrane conductance regulator with members of the SLC26 family of anion transporters (SLC26A8 and SLC26A9): physiological and pathophysiological relevance. Int J Biochem Cell Biol. 2014;52:58–67. Loriol C, Dulong S, Avella M, et al. Characterization of SLC26A9, facilitation of Cl- transport by bicarbonate. Cell Physiol Biochem. 2008;22(1–4):015–030. Bertrand CA, Zhang R, Pilewski JM, Frizzell RA. SLC26A9 is a constitutively active, CFTR-regulated anion conductance in human bronchial epithelia. J Gen Physiol. 2009;133(4):421–438. Ousingsawat J, Schreiber R, Kunzelmann K. Differential contribution of SLC26A9 to Cl− conductance in polarized and non-polarized epithelial cells. J Gen Physiol. 2012;227(6):2323–2329. Haardt M, Benharouga M, Lechardeur D, Kartner N, Lukacs GL. C-terminal truncations destabilize the cystic fibrosis transmembrane conductance regulator without impairing its biogenesis: a novel class of mutation. J Biol Chem. 1999;274(31):21873–21877. Welsh MJ, Smith AE. Molecular mechanisms of CFTR chloride channel dysfunction in cystic fibrosis. Cell. 1993;73(7):1251–1254. Quint A, Lerer I, Sagi M, Abeliovich D. Mutation spectrum in Jewish cystic fibrosis patients in Israel: implication to carrier screening. Am J Med Genet A. 2005;136A(3):246–248. Cheng SH, Gregory RJ, Marshall J, et al. Defective intracellular transport and processing of CFTR is the molecular basis of most cystic fibrosis. Cell. 1990;63(4):827–834. Denning GM, Anderson MP, Amara JF, Marshall J, Smith AE, Welsh MJ. Processing of mutant cystic fibrosis transmembrane conductance regulator is temperature-sensitive. Nature. 1992;358(6389):761–764. Bobadilla JL, Macek M, Fine JP, Farrell PM. Cystic fibrosis: a worldwide analysis of CFTR mutations – correlation with incidence data and application to screening. Hum Mutat. 2002;19(6):575–606. Dalemans W, Barbry P, Champigny G, et al. Altered chloride ion channel kinetics associated with the ΔF508 cystic fibrosis mutation. Nature. 1991;354(6354):526–528. Varga K, Goldstein RF, Jurkuvenaite A, et al. Enhanced cell surface stability of rescued ΔF508 cystic fibrosis transmembrane conductance regulator by pharmacological chaperones. Biochem J. 2008;410(3):555–564. Dey I, Shah K, Bradbury NA. Natural compounds as therapeutic agents in the treatment cystic fibrosis. J Genet Syndr Gene Ther. 2016;7(1):284. Drumm M, Wilkinson D, Smit L, et al. Chloride conductance expressed by delta F508 and other mutant CFTRs in Xenopus oocytes. Science. 1991;254(5039):1797–1799. Becq F, Jensen TJ, Chang XB, et al. Phosphatase inhibitors activate normal and defective CFTR chloride channels. Proc Natl Acad Sci U S A. 1994;91(19):9160–9164. Becq F, Fanjul M, Merten M, Figarella C, Hollande E, Gola M. Possible regulation of CFTR-chloride channels by membrane-bound phosphatases in pancreatic duct cells. FEBS Lett. 1993;327(3):337–342. Chappe V, Mettey Y, Vierfond JM, et al. Structural basis for specificity and potency of xanthine derivatives as activators of the CFTR chloride channel. Br J Pharmacol. 1998;123(4):683–693. Cohen BE, Lee G, Jacobson KA, et al. 8-Cyclopentyl-1,3-dipropylxanthine and other xanthines differentially bind to the wild-type and ΔF508 mutant first nucleotide binding fold (NBF-1) domains of the cystic fibrosis transmembrane conductance regulator. Biochemistry. 1997;36(21):6455–6461. Illek B, Fischer H. Flavonoids stimulate Cl conductance of human airway epithelium in vitro and in vivo. Am J Physiol Lung Cell Mol Physiol. 1998;275(5):L902–L910. French PJ, Bijman J, Bot AG, Boomaars WE, Scholte BJ, de Jonge HR. Genistein activates CFTR Cl- channels via a tyrosine kinase- and protein phosphatase-independent mechanism. Am J Physiol Cell Physiol. 1997;273(2):C747–C753. Illek B, Fischer H, Santos GF, Widdicombe JH, Machen TE, Reenstra WW. cAMP-independent activation of CFTR Cl channels by the tyrosine kinase inhibitor genistein. Am J Physiol Cell Physiol. 1995;268(4):C886–C893. Hwang TC, Wang F, Yang IC, Reenstra WW. Genistein potentiates wild-type and delta F508-CFTR channel activity. Am J Physiol. 1997;273(3 pt 1):C988–C998. Moran O, Galietta LJV, Zegarra-Moran O. Binding site of activators of the cystic fibrosis transmembrane conductance regulator in the nucleotide binding domains. Cell Mol Life Sci. 2005;62(4):446–460. Wang W, Bernard K, Li G, Kirk KL. Curcumin opens cystic fibrosis transmembrane conductance regulator channels by a novel mechanism that requires neither ATP binding nor dimerization of the nucleotide-binding domains. J Biol Chem. 2007;282(7):4533–4544. Egan ME, Glockner-Pagel J, Ambrose CA, et al. Calcium-pump inhibitors induce functional surface expression of delF508-CFTR protein in cystic fibrosis epithelial cells. Nat Med. 2002;8(5):485–492. Song Y, Sonawane ND, Salinas D, et al. Evidence against the rescue of defective ΔF508-CFTR cellular processing by curcumin in cell culture and mouse models. J Biol Chem. 2004;279(39):40629–40633. Grubb BR, Gabriel SE, Mengos A, et al. SERCA pump inhibitors do not correct biosynthetic arrest of ΔF508 CFTR in cystic fibrosis. Am J Respir Cell Mol Biol. 2006;34(3):355–363. Yang S, Yu B, Sui Y, et al. CFTR chloride channel is a molecular target of the natural cancer preventive agent resveratrol. Pharmazie. 2013;68(9):772–776. Alexander NS, Hatch N, Zhang S, et al. Resveratrol has salutary effects on mucociliary transport and inflammation in sinonasal epithelium. Laryngoscope. 2011;121(6):1313–1319. Dhooghe B, Bouckaert C, Capron A, Wallemacq P, Leal T, Noel S. Resveratrol increases F508del-CFTR dependent salivary secretion in cystic fibrosis mice. Biol Open. 2015;4(7):929–936. Woodworth BA. Resveratrol ameliorates abnormalities of fluid and electrolyte secretion in a hypoxia-induced model of acquired CFTR deficiency. Laryngoscope. 2015;125(suppl 7):S1–S13. Hamdaoui N, Baudoin-Legros M, Kelly M, et al. Resveratrol rescues cAMP-dependent anionic transport in the cystic fibrosis pancreatic cell line CFPAC1. Br J Pharmacol. 2011;163(4):876–886. Jai Y, Shah K, Bridges RJ, Bradbury NA. Evidence against resveratrol as a viable therapy for the rescue of defective ΔF508 CFTR. Biochim Biophys Acta. 2015;1850(11):2377–2384. Hay Mele B, Citro V, Andreotti G, Cubellis MV. Drug repositioning can accelerate discovery of pharmacological chaperones. Orphanet J Rare Dis. 2015;10:55. Sawkar AR, Cheng WC, Beutler E, Wong CH, Balch WE, Kelly JW. Chemical chaperones increase the cellular activity of N370S β-glucosidase: a therapeutic strategy for Gaucher disease. Proc Natl Acad Sci U S A. 2002;99(24):15428–15433. Noël S, Wilke M, Bot AGM, De Jonge HR, Becq F. Parallel improvement of sodium and chloride transport defects by miglustat (n-butyldeoxynojyrimicin) in cystic fibrosis epithelial cells. J Pharmacol Exp Ther. 2008;325(3):1016–1023. Norez C, Noel S, Wilke M, et al. Rescue of functional delF508-CFTR channels in cystic fibrosis epithelial cells by the α-glucosidase inhibitor miglustat. FEBS Lett. 2006;580(8):2081–2086. Leonard A, Lebecque P, Dingemanse J, Leal T. A randomized placebo-controlled trial of miglustat in cystic fibrosis based on nasal potential difference. J Cyst Fibros. 2012;11(3):231–236. Peak TC, Yafi FA, Sangkum P, Hellstrom WJG. Emerging drugs for the treatment of erectile dysfunction. Expert Opin Emerg Drugs. 2015;20(2):263–275. Hambly N, Granton J. Riociguat for the treatment of pulmonary hypertension. Expert Rev Respir Med. 2015;9(6):679–695. Leier G, Bangel-Ruland N, Sobczak K, Knieper Y, Weber WM. Sildenafil acts as potentiator and corrector of CFTR but might be not suitable for the treatment of CF lung disease. Cell Physiol Biochem. 2012;29(5–6):775–790. Dormer RL, Harris CM, Clark Z, et al. Sildenafil (Viagra) corrects ΔF508-CFTR location in nasal epithelial cells from patients with cystic fibrosis. Thorax. 2005;60(1):55–59. Dhooghe B, Noël S, Bouzin C, Behets-Wydemans G, Leal T. Correction of chloride transport and mislocalization of CFTR protein by vardenafil in the gastrointestinal tract of cystic fibrosis mice. PLoS One. 2013;8(10):e77314. Lubamba B, Lecourt H, Lebacq J, et al. Preclinical evidence that sildenafil and vardenafil activate chloride transport in cystic fibrosis. Am J Respir Crit Care Med. 2008;177(5):506–515. Taylor-Cousar JL, Wiley C, Felton LA, et al. Pharmacokinetics and tolerability of oral sildenafil in adults with cystic fibrosis lung disease. J Cyst Fibros. 2015;14(2):228–236. Mittendorf J, Weigand S, Alonso-Alija C, et al. Discovery of riociguat (BAY 63-2521): a potent, oral stimulator of soluble guanylate cyclase for the treatment of pulmonary hypertension. ChemMedChem. 2009;4(5):853–865. Carlile GW, Robert R, Goepp J, et al. Ibuprofen rescues mutant cystic fibrosis transmembrane conductance regulator trafficking. J Cyst Fibros. 2015;14(1):16–25. Gahl WA. Early oral cysteamine therapy for nephropathic cystinosis. Eur J Pediatr. 2003;162(1):S38–S41. Luciani A, Villella VR, Esposito S, et al. Defective CFTR induces aggresome formation and lung inflammation in cystic fibrosis through ROS-mediated autophagy inhibition. Nat Cell Biol. 2010;12(9):863–875. Abdulrahman BA, Khweek AA, Akhter A, et al. Autophagy stimulation by rapamycin suppresses lung inflammation and infection by Burkholderia cenocepacia in a model of cystic fibrosis. Autophagy. 2011;7(11):1359–1370. Luciani A, Villella VR, Esposito S, et al. Targeting autophagy as a novel strategy for facilitating the therapeutic action of potentiators on ΔF508 cystic fibrosis transmembrane conductance regulator. Autophagy. 2012;8(11):1657–1672. Stefano DD, Villella VR, Esposito S, et al. Restoration of CFTR function in patients with cystic fibrosis carrying the F508del-CFTR mutation. Autophagy. 2014;10(11):2053–2074. Tosco A, De Gregorio F, Esposito S, et al. A novel treatment of cystic fibrosis acting on-target: cysteamine plus epigallocatechin gallate for the autophagy-dependent rescue of class II-mutated CFTR. Cell Death Differ. Epub 2016 Jul 22. Sirtori CR. Aescin: pharmacology, pharmacokinetics and therapeutic profile. Pharmacol Res. 2001;44(3):183–193. Mutyam V, Du M, Xue X, et al. Discovery of clinically approved agents that promote suppression of CFTR nonsense mutations. Am J Respir Crit Care Med. Epub 2016 Apr 22. Ma T, Vetrivel L, Yang H, et al. High-affinity activators of cystic fibrosis transmembrane conductance regulator (CFTR) chloride conductance identified by high-throughput screening. J Biol Chem. 2002;277(40):37235–37241. Pedemonte N, Lukacs GL, Du K, et al. Small-molecule correctors of defective ΔF508-CFTR cellular processing identified by high-throughput screening. J Clin Invest. 2005;115(9):2564–2571. Sermet-Gaudelus I, Renouil M, Fajac A, et al. In vitro prediction of stop-codon suppression by intravenous gentamicin in patients with cystic fibrosis: a pilot study. BMC Med. 2007;5:5–5. Howard M, Frizzell RA, Bedwell DM. Aminoglycoside antibiotics restore CFTR function by overcoming premature stop mutations. Nat Med. 1996;2(4):467–469. Bedwell DM, Kaenjak A, Benos DJ, et al. Suppression of a CFTR premature stop mutation in a bronchial epithelial cell line. Nat Med. 1997;3(11):1280–1284. Wilschanski M, Yahav Y, Yaacov Y, et al. Gentamicin-induced correction of CFTR function in patients with cystic fibrosis and CFTR stop mutations. N Engl J Med. 2003;349(15):1433–1441. Wilschanski M, Famini C, Blau H, et al. A pilot study of the effect of gentamicin on nasal potential difference measurements in cystic fibrosis patients carrying stop mutations. Am J Respir Crit Care Med. 2000;161(3):860–865. Clancy JP, Bebök Z, Ruiz F, et al. Evidence that systemic gentamicin suppresses premature stop mutations in patients with cystic fibrosis. Am J Respir Crit Care Med. 2001;163(7):1683–1692. Clancy JP, Rowe SM, Bebok Z, et al. No detectable improvements in cystic fibrosis transmembrane conductance regulator by nasal aminoglycosides in patients with cystic fibrosis with stop mutations. Am J Respir Cell Mol Biol. 2007;37(1):57–66. Nudelman I, Rebibo-Sabbah A, Cherniavsky M, et al. Development of novel aminoglycoside (NB54) with reduced toxicity and enhanced suppression of disease-causing premature stop mutations. J Med Chem. 2009;52(9):2836–2845. Sabbavarapu NM, Shavit M, Degani Y, Smolkin B, Belakhov V, Baasov T. Design of novel aminoglycoside derivatives with enhanced suppression of diseases-causing nonsense mutations. ACS Med Chem Lett. 2016;7(4):418–423. Xue X, Mutyam V, Tang L, et al. Synthetic aminoglycosides efficiently suppress cystic fibrosis transmembrane conductance regulator nonsense mutations and are enhanced by ivacaftor. Am J Respir Cell Mol Biol. 2014;50(4):805–816. Du M, Jones JR, Lanier J, et al. Aminoglycoside suppression of a premature stop mutation in a Cftr-/- mouse carrying a human CFTR-G542X transgene. J Mol Med (Berl). 2002;80(9):595–604. Hamed S. Drug evaluation: PTC-124: a potential treatment of cystic fibrosis and Duchenne muscular dystrophy. IDrugs. 2006;9(11):783–789. Kerem E, Hirawat S, Armoni S, et al. Effectiveness of PTC124 treatment of cystic fibrosis caused by nonsense mutations: a prospective phase II trial. Lancet. 2008;372(9640):719–727. Sermet-Gaudelus I, De Boeck K, Casimir GJ, et al. Ataluren (PTC124) induces cystic fibrosis transmembrane conductance regulator protein expression and activity in children with nonsense mutation cystic fibrosis. Am J Respir Crit Care Med. 2010;182(10):1262–1272. Kerem E, Konstan MW, De Boeck K, et al; Cystic Fibrosis Ataluren Study Group. Ataluren for the treatment of nonsense-mutation cystic fibrosis: a randomised, double-blind, placebo-controlled phase 3 trial. Lancet Respir Med. 2014;2(7):539–547. Brown CR, Hong-Brown LQ, Biwersi J, Verkman AS, Welch WJ. Chemical chaperones correct the mutant phenotype of the ΔF508 cystic fibrosis transmembrane conductance regulator protein. Cell Stress Chaperones. 1996;1(2):117–125. Sato S, Ward CL, Krouse ME, Wine JJ, Kopito RR. Glycerol reverses the misfolding phenotype of the most common cystic fibrosis mutation. J Biol Chem. 1996;271(2):635–638. Moyer BD, Loffing-Cueni D, Loffing J, Reynolds D, Stanton BA. Butyrate increases apical membrane CFTR but reduces chloride secretion in MDCK cells. Am J Physiol. 1999;277(2):F271–F276. Rubenstein RC, Egan ME, Zeitlin PL. In vitro pharmacologic restoration of CFTR-mediated chloride transport with sodium 4-phenylbutyrate in cystic fibrosis epithelial cells containing delta F508-CFTR. J Clin Invest. 1997;100(10):2457–2465. Rubenstein RC, Zeitlin PL. Sodium 4-phenylbutyrate downregulates Hsc70: implications for intracellular trafficking of ΔF508-CFTR. Am J Physiol Cell Physiol. 2000;278(2):C259–C267. Rubenstein R, Zeitlin P. A pilot clinical trial of oral sodium 4-phenylbutyrate (Buphenyl) in Δ F508-homozygous cystic fibrosis patients. Am J Respir Crit Care Med. 1998;157(2):484–490. Loo T, Bartlett M, Clarke D. Correctors promote folding of the CFTR in the endoplasmic reticulum. Biochem J. 2008;413(1):29–36. Loo T, Bartlett M, Wang Y, Clarke D. The chemical chaperone CFcor-325 repairs folding defects in the transmembrane domains of CFTR-processing mutants. Biochem J. 2006;395(pt 3):537–542. Hutt DM, Herman D, Rodrigues APC, et al. Reduced histone deacetylase 7 activity restores function to misfolded CFTR in cystic fibrosis. Nat Chem Biol. 2010;6(1):25–33. Sampson H, Robert R, Liao J, et al. Identification of a NBD1-binding pharmacological chaperone that corrects the trafficking defect of F508del-CFTR. Chem Biol. 2011;18(2):231–242. Ren HY, Grove DE, De La Rosa O, et al. VX-809 corrects folding defects in cystic fibrosis transmembrane conductance regulator protein through action on membrane-spanning domain 1. Mol Biol Cell. 2013;24(19):3016–3024. Van Goor F, Hadida S, Grootenhuis PDJ, et al. Correction of the F508del-CFTR protein processing defect in vitro by the investigational drug VX-809. Proc Natl Acad Sci U S A. 2011;108(46):18843–18848. Clancy JP, Rowe SM, Accurso FJ, et al. Results of a phase IIa study of VX-809, an investigational CFTR corrector compound, in subjects with cystic fibrosis homozygous for the F508del-CFTR mutation. Thorax. 2012;67(1):12–18. Boyle MP, Bell SC, Konstan MW, et al; VX09-809-102 Study Group. A CFTR corrector (lumacaftor) and a CFTR potentiator (ivacaftor) for treatment of patients with cystic fibrosis who have a phe508del CFTR mutation: a phase 2 randomised controlled trial. Lancet Respir Med. 2014;2(7):527–538. Wainwright CE, Elborn JS, Ramsey BW, et al. Lumacaftor–ivacaftor in patients with cystic fibrosis homozygous for Phe508del CFTR. N Engl J Med. 2015;373(3):220–231. Jones AM, Barry PJ. Lumacaftor/ivacaftor for patients homozygous for Phe508del-CFTR: should we curb our enthusiasm? Thorax. 2015;70(7):615–616. Orenstein DM, O’Sullivan BP, Quinton PM. Cystic fibrosis: breakthrough drugs at break-the-bank prices. Glob Adv Health Med. 2015;4(6):8–57. Cholon DM, Quinney NL, Fulcher ML, et al. Potentiator ivacaftor abrogates pharmacological correction of ΔF508 CFTR in cystic fibrosis. Sci Transl Med. 2014;6(246):246ra296. Veit G, Avramescu RG, Perdomo D, et al. Some gating potentiators, including VX-770, diminish ΔF508-CFTR functional expression. Sci Transl Med. 2014;6(246):246ra297. Pilewski JM, Cooke J, Lekstrom-Himes J, Donaldson S. WS01.4 VX-661 in combination with ivacaftor in patients with cystic fibrosis and the F508del-CFTR mutation. J Cyst Fibros. 2015;14:S1. Beumer W, Swildens J, Henig N, et al. WS01.2 QR-010, an RNA therapy, restores CFTR function using in vitro and in vivo models of delF508 CFTR. J Cyst Fibros. 2015;14:S1. Henig N, Beumer W, Anthonijsz H, et al. QR-010, an RNA Therapy, Restores CFTR Function in the Saliva Secretion Assay. A37. It Won’t be Long: Advances in Adult Cystic Fibrosis. New York, NY: American Thoracic Society; 2015:A1449–A1449. Van Goor F, Hadida S, Grootenhuis PDJ, et al. Rescue of CF airway epithelial cell function in vitro by a CFTR potentiator, VX-770. Proc Natl Acad Sci U S A. 2009;106(44):18825–18830. Accurso FJ, Rowe SM, Clancy JP, et al. Effect of VX-770 in persons with cystic fibrosis and the G551D-CFTR mutation. N Engl J Med. 2010;363(21):1991–2003. Davies J, Sheridan H, Bell N, et al. Assessment of clinical response to ivacaftor with lung clearance index in cystic fibrosis patients with a G551D-CFTR mutation and preserved spirometry: a randomised controlled trial. Lancet Respir Med. 2013;1(8):630–638. Ramsey BW, Davies J, McElvaney NG, et al; VX08-770-102 Study Group. A CFTR potentiator in patients with cystic fibrosis and the G551D mutation. N Engl J Med. 2011;365(18):1663–1672. De Boeck K, Munck A, Walker S, et al. Efficacy and safety of ivacaftor in patients with cystic fibrosis and a non-G551D gating mutation. J Cyst Fibros. 2014;13(6):674–680. Davies JC, Cunningham S, Harris WT, et al. Safety, pharmacokinetics, and pharmacodynamics of ivacaftor in patients aged 2–5 years with cystic fibrosis and a CFTR gating mutation (KIWI): an open-label, single-arm study. Lancet Respir Med. 2016;4(2):107–115. Flume PA, Liou TG, Borowitz DS, et al; VX 08-770-104 Study Group. Ivacaftor in subjects with cystic fibrosis who are homozygous for the F508del-CFTR mutation. Chest. 2012;142(3):718–724. Shamsah K, Jose A, Laurie D, et al. QBW251 is a safe and efficacious CFTR potentiator for patients with cystic fibrosis. Am J Respir Crit Care Med. 2016;193:A7789. Vanhoutte FP, Gouy M, Haazen W, et al. Safety, tolerability and pharmacokinetics of a novel CFTR potentiator GPLG1837 in healthy volunteers. Pediatr Pulmonol. 2015;50(S41):S289. Marozkina NV, Yemen S, Borowitz M, et al. Hsp 70/Hsp 90 organizing protein as a nitrosylation target in cystic fibrosis therapy. Proc Natl Acad Sci U S A. 2010;107(25):11393–11398. Zaman K, Sawczak V, Zaidi A, et al. Augmentation of CFTR maturation by S-nitrosoglutathione reductase. Am J Physiol Lung Cell Mol Physiol. 2016;310(3):L263–L270. Zaman K, Carraro S, Doherty J, et al. S-nitrosylating agents: a novel class of compounds that increase cystic fibrosis transmembrane conductance regulator expression and maturation in epithelial cells. Mol Pharmacol. 2006;70(4):1435–1442. Taylor-Cousar J, Zemanick E, Solomon G. The pharmacokinetics of N91115, an inhibitor of S-nitrosoglutathione reductase in cystic fibrosis patients. Pediatr Pulmonol. 2015;50(S41):S285–S286. Miller J, Drew L, Green O, et al. Amplifiers are a new class of CFTR modulators that increase the abundance of CFTR protein and combined with potentiators and correctors enhance chloride transport activity. Pediatr Pulmonol. 2015;50(S41):S265. Dhooghe B, Haaf JB, Noel S, Leal T. Strategies in early clinical development for the treatment of basic defects of cystic fibrosis. Expert Opin Investig Drugs. 2016;25(4):423–436.